Imagine having an expert irrigation technician in the field 24 hours a day. A technician that is forever adjusting schedules according to climatic or soil-moisture conditions, detecting and reporting communication, electrical and pipe failures, and taking corrective action to shut down and bypass specific problem zones. Rain Master's DX2 field-intelligent controller is the ultimate field technician, processing sensory data and communicating real-time field failures immediately and dependably. Coupled with the Evolution Central System, the DX2 controller provides the ultimate synergy. The Evolution DX2 combines an unprecedented level of programming features and water management capabilities as well as sophisticated maintenance functions combined in a very simple easy to use controller. Program 12 independent programs, or optional independent station control (up to 48 programs), select a two week, skip by day, or 31 day schedule format, continuous cycle or conventional modes. From a maintenance perspective, the Evolution DX2 is a star performer. With a built-in amperage meter and flow meter, field wiring electrical current can be viewed directly in the LCD display along with flow data. The intelligence of the DX2 allows it to "learn" nominal flow limits (both upper and lower) as well as current limits with the push of a button. Once limits have been established field related problems are automatically diagnosed and recorded for the user. These alarm conditions are date time stamped and contain specific information to aid in problem correction. 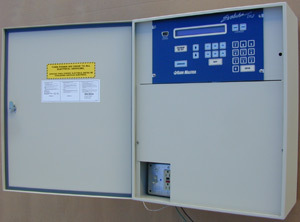 The user is always informed of field related problems right on the LCD display. Measuring a system's ability to implement scheduling and other hydraulic functions is an invaluable tool, Rain Master's Flow Max feature strengthens the DX2's command by monitoring real-time flow information from a single point of connection and performing dynamic limit adjustments across multiple satellites. Flow and electrical-current limits are established automatically while Flow Max controls a common pump and up to two master valves, without the need for peripheral relays and wiring. 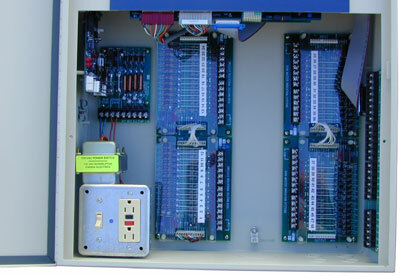 Designed with short-circuit proof station outputs, nonvolatile memory to retain all programs, select components, optional heavy-duty lightning and surge protection and a modular station output board design, Rain Master's DX2 satellite system is the new generation in irrigation control. Enjoy the benefits and capability of its stand-alone power or add versatility by easily expanding to a central system. Enter the new millennium in irrigation control with Rain Master's Evolution DX2 central satellite series.